When the twenty-one-year-old Beethoven arrived in Vienna from his native Bonn in November 1792, the omens could hardly have been more favourable. Haydn, whom he had met in Bonn, had taken him on as a pupil, with all the cachet that implied; and through the recommendation of Count Waldstein, and Haydn’s own contacts, the headstrong sans-culotte gained immediate access to the palaces and salons of the musically cultivated Viennese aristocracy. As Beethoven’s own pupil Carl Czerny later put it, the youthful composer-virtuoso ‘received all kinds of support from our high aristocracy, and enjoyed as much care and respect as were ever enjoyed by a young artist’. Within weeks of his arrival in the imperial capital Beethoven became a house guest of his principal patron Prince Karl Lichnowsky, a talented amateur pianist who kept his own string quartet. The Prince held regular private soirées at which Beethoven would astonish the company with his brilliant keyboard improvisations; and it was at one of these occasions that he chose to introduce his first important Viennese compositions, the set of three piano trios which he published by subscription in August 1795 with a dedication to Lichnowsky. His erstwhile teacher Haydn, recently returned from his second triumphant London visit, was present, and warmly praised the E flat and G major trios. But he suggested that the third trio, in C minor, would not be easily understood by the Viennese public—a well-intentioned remark that the ever-touchy Beethoven put down to envy. Beethoven was determined to impress and challenge the Viennese musical elite with his first published opus. And with their weighty four-movement structures and urgency of musical dialectic, the Op 1 trios must have seemed like a full-frontal assault on the traditional notion of the piano trio: what had been an intimate domestic medium in Mozart’s and Haydn’s hands suddenly became a symphony for three instruments. In the first two trios Beethoven’s subversiveness was still cloaked in the language of the classical comedy of manners. But in the C minor, No 3, it erupted in a work of startling explosive vehemence and dark lyric beauty. While it may have shocked some of its early listeners, Haydn included, the C minor Trio gradually became one of Beethoven’s most popular chamber works. More than two decades later, in 1817, an amateur composer named Herr Kaufmann submitted to him an arrangement he had made for string quintet, with two violas. Beethoven had it copied out, decided he could do better, and made wholesale improvements to the part-writing. At the top of the score he wrote a jokey, ironic preface, mocking Kaufmann’s efforts as a ‘three-voice quintet’ which he had raised ‘from the greatest wretchedness to some respectability’, sacrificing the original ‘as a solemn burnt offering to the gods of the underworld’. Beethoven did not jettison Kaufmann’s ideas altogether; and the final arrangement, published in 1819 as Op 104, was thus something of a composite effort. The first violin line occasionally betrays its keyboard origins. Yet for the most part the quintet arrangement sounds thoroughly idiomatic, with the most obviously pianistic passages recast for strings and the textures enriched by many touches of imitation. Beethoven’s only, minor, structural change was in the finale, where the recapitulation was originally introduced by a flamboyant chromatic scale for the keyboard—a kind of mini-cadenza. For the quintet arrangement this lead-back becomes ‘thematic’ rather than decorative: the lower parts sound the first four notes of the main theme, while the chromatic scale, now in the first violin, is reduced from eight bars to four. The mysterious, ‘pregnant’ unison opening (deprived of its initial ‘turn’ in the quintet version) is, coincidentally or not, reminiscent of Mozart’s Piano Concerto in the same key, K491, a work Beethoven is said to have greatly admired. But the music is profoundly Beethovenian in its abrupt, extreme contrasts, with violent rhetoric (the first page alone is peppered with sforzando accents) alternating with intense pathos and yearning lyricism. The famous heroic narratives of Beethoven’s ‘middle period’ are already in view. There is a thrilling moment at the start of the development where the original pianissimo echo of the main theme a step higher now moves a semitone lower, spiriting the music to a strange new tonal region (C flat major, enharmonically spelt as B major). It is typical of Beethoven, at any period, that the quiet opening phrase returns as a strenuous fortissimo at the start of the recapitulation. Then, in perhaps the most breathtaking stroke of all, the music slips first into C major, pianissimo, with the cello taking the lead (imitated in the quintet arrangement by the first violin), and then into the ‘Neapolitan’ key of D flat for a new cantabile development of the main theme. After this high-pressure sonata drama, the slow movement, a set of variations in E flat on one of Beethoven’s characteristically plain, hymn-like themes, lowers the tension. But there are plenty of inventive, authentically Beethovenian moments: the boisterous third variation, with its brusque sforzando accents and twanging pizzicatos; the fourth, in E flat minor, initiated by a plangent cello solo; or the coda, beginning with a rich chromatic reworking of the theme. The third movement, somewhere between a minuet and a scherzo, returns to the agitated, explosive C minor world of the first movement. 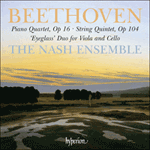 In the C major trio section Beethoven has fun roughing up the cello’s lilting Ländler melody—enriched in the quintet version by a countermelody for second viola—with cussed offbeat accents. The Prestissimo finale (the tempo marking is typical of the young Beethoven’s determination to be ‘extreme’) juxtaposes violence, suppressed agitation and, in the E flat second theme, lyrical tenderness. In the recapitulation the second theme turns from C major to C minor, with deeply pathetic effect. The astonishing coda, held down to pianissimo for most of its eighty-seven bars, slips mysteriously to B minor and then moves, via C minor and F minor, to C major. But the ending is uneasy and equivocal, with minimal sense of resolution (the recent memory of F minor is too strong for that), let alone of major-keyed optimism. En novembre 1792, Beethoven, âgé de vingt et un ans, débarqua à Vienne de son Bonn natal sous de très favorables augures. Haydn, rencontré à Bonn, l’avait accepté comme élève, avec tout l’éclat que cela supposait, et ses contacts, ajoutés à la recommandation du comte Waldstein, avaient permis à l’impétueux «sans-culotte» d’accéder d’emblée aux palais et aux salons de l’aristocratie viennoise, musicalement cultivée. Comme le dira plus tard son élève Carl Czerny, le jeune compositeur-virtuose «reçut tous les soutiens possibles de notre haute aristocratie et fut l’objet de plus d’attention et de respect qu’aucun autre jeune artiste». Quelques semaines après son arrivée dans la capitale impériale, Beethoven fut l’invité de son principal mécène, le prince Karl Lichnowsky, un talentueux pianiste amateur qui entretenait son propre quatuor à cordes et donnait régulièrement des soirées privées au cours desquelles le jeune musicien stupéfiait l’auditoire par ses brillantes improvisations au clavier. Ce fut l’une de ces soirées que Beethoven choisit pour présenter ses premières compositions viennoises d’importance, ses trois trios avec piano publiés par souscription en août 1795, avec une dédicace à Lichnowsky. Récemment rentré de son deuxième séjour triomphal à Londres, Haydn, qui assista à l’événement, loua chaleureusement les trios en mi bémol et en sol majeur tout en suggérant que le dernier, celui en ut mineur, ne serait pas facilement compris par le public viennois—une remarque bien intenionnée que Beethoven, toujours susceptible, mit sur le compte de la jalousie. Beethoven était résolu à ce que son premier opus publié impressionnât et défiât l’élite musicale viennoise. De fait, avec leurs pesantes structures en quatre mouvements et leur insistante dialectique musicale, les trios op. 1 ont dû être comme un coup frontal assené à la notion traditionnelle du trio avec piano qui, d’intime et privé entre les mains de Mozart et de Haydn, devint soudain une symphonie pour trois instruments. Dans les deux premiers trios, la subversion beethovénienne est encore revêtue du langage de la comédie de mœurs classique. Mais dans le troisième, en ut mineur, elle jaillit en une œuvre d’une étincelante véhémence explosive, à la sombre beauté lyrique. Bien qu’il ait pu choquer certains de ses premiers auditeurs—Haydn y compris—, ce Trio en ut mineur devint peu à peu l’une des œuvres de chambre les plus populaires de Beethoven qui, deux bonnes décennies plus tard (1817), en reçut un arrangement pour quintette à cordes avec deux altos d’un certain Herr Kaufmann, compositeur amateur. Il le copia et, persuadé de pouvoir faire mieux, en améliora massivement la conduite des parties. En haut de la partition, il rédigea une préface comique, ironique, où il qualifia les efforts de Kaufmann d’un railleur «quintette à trois voix», précisant qu’il l’avait «élevé d’une très grande misérabilité à un aspect passable», sacrifiant l’original «en holocauste solennel aux dieux infernaux». Beethoven n’abandonna pas complètement les idées de Kaufmann et l’arrangement final, publié en 1819 sous le numéro d’opus 104, fut une manière de composite. La ligne du premier violon trahit parfois ses origines claviéristiques mais, la plupart du temps, l’arrangement en quintette est profondément idiomatique: les passages les plus manifestement pianistiques sont refondus pour cordes et les textures sont enrichies par maintes touches d’imitation. Beethoven n’apporta qu’un seul petit changement structurel, dans le finale, où la réexposition était originellement introduite par une flamboyante gamme chromatique destinée au clavier—une sorte de mini-cadenza. Pour l’arrangement en quintette, ce retour devient plus thématique que décoratif: les parties inférieures énoncent les quatre premières notes du thème principal, tandis que la gamme chromatique, désormais au premier violon, est réduite de huit à quatre mesures. Hasard ou non, l’ouverture à l’unisson, mystérieuse et lourde de sens (mais privée, dans la version pour quintette, de son grupetto initial), rappelle le Concerto pour piano K491 de Mozart, écrit dans la même tonalité et tant admiré, dit-on, de Beethoven. Mais la musique est profondément beethovénienne dans ses contrastes soudains, extrêmes, une rhétorique violente (la seule première page est criblée d’accents sforzando) alternant avec un pathos intense et un lyrisme ardent. Les fameuses narrations héroïques du Beethoven «deuxième manière» sont déjà là. Le début du développement est marqué par un moment saisissant, où l’écho original pianissimo du thème principal, au degré supérieur, passe au demi-ton inférieur, entraînant la musique dans une nouvelle, et étrange, région tonale (ut bémol majeur, enharmoniquement énoncé en si majeur). Fait typique du compositeur, toutes manières confondues, la paisible phrase initiale revient en un fortissimo vigoureux, au début de la réexposition. Puis, dans ce qui est peut-être le coup le plus époustouflant, la musique glisse en ut majeur, pianissimo, le violoncelle prenant alors les commandes (imité, dans l’arrangement pour quintette, par le premier violon), avant de gagner la tonalité «napolitaine» de ré bémol pour un nouveau développement cantabile du thème principal. Passé ce drame-sonate de choc, le mouvement lent—une série de variations en mi bémol sur un thème hymnique, simple, typique—apaise la tension. Reste que les moments inventifs, authentiquement beethovéniens, abondent: la tumultueuse troisième variation, avec ses brusques accents sforzando et ses pizzicatos nasillards; la quatrième, en mi bémol mineur, initiée par un plaintif solo de violoncelle; ou encore la coda, qu’ouvre une riche réécriture chromatique du thème. Le troisième mouvement, qui tient le milieu entre un menuet et un scherzo, retrouve l’explosivité et l’animation de l’univers en ut mineur du premier mouvement. Dans le trio mouvement en ut majeur, Beethoven s’amuse à bouleverser l’allant Ländler violoncellistique—enrichi, dans le quintette, d’une contre-mélodie au second alto—, par d’entêtés accents anacroustiques. Le finale Prestissimo (une indication de tempo que dit toute la détermination du jeune Beethoven à être «extrême») juxtapose violence, agitation contenue et, dans le second thème en mi bémol, tendresse lyrique. Dans la réexposition, le second thème passe d’ut majeur à ut mineur, avec un effet des plus pathétiques. La stupéfiante coda, maintenue à pianissimo durant l’essentiel de ses quatre-vingt-sept mesures, glisse mystérieusement en si mineur avant de gagner ut majeur via ut mineur et fa mineur. Mais la conclusion est inquiète et équivoque, avec un sentiment de résolution minimal (le récent souvenir de fa mineur est encore trop fort), alors pour ce qui est de l’optimisme en majeur. Als der 21-jährige Beethoven im November 1792 von seiner Heimatstadt Bonn nach Wien zog, hätten die Vorzeichen kaum günstiger stehen können. Haydn, den er bereits in Bonn kennengelernt hatte, hatte ihn als Schüler angenommen, was natürlich an sich schon eine große Auszeichnung war. Zudem bekam der eigensinnige Sansculotte durch die Empfehlung des Grafen Waldstein und auch durch Haydns eigene Kontakte Zugang zu den Palästen und Salons der musikalisch gebildeten Wiener Aristokratie. Der Beethovenschüler Carl Czerny sagte später, dass der jugendliche Komponist und Virtuose auf verschiedene Art und Weise von der Hocharistokratie unterstützt und dass kaum einem jungen Künstler jemals mehr Respekt und Zuwendung widerfahren sei. Nur Wochen nachdem er in der kaiserlichen Hauptstadt angekommen war, wurde Beethoven Hausgast bei seinem Hauptförderer, dem Fürsten Karl Lichnowsky, der selbst ein begabter Klavierspieler war und sein eigenes Streichquartett hatte. Der Fürst organisierte regelmäßige Privatsoireen, bei denen Beethoven die Gesellschaft mit seinen brillanten Klavierimprovisationen beeindruckte, und es war bei einer solchen Gelegenheit, dass er seine ersten wichtigen Wiener Kompositionen vorführte, nämlich die drei Klaviertrios, die er mit einer Widmung an Lichnowsky im August 1795 als Subskriptionsausgabe veröffentlichte. Sein ehemaliger Lehrer Haydn, der gerade von seiner zweiten erfolgreichen Londonreise zurückgekehrt war, war ebenfalls anwesend und war voll des Lobes für die Trios in Es-Dur und G-Dur. Er glaubte jedoch, dass das dritte Trio in c-Moll vom Wiener Publikum nicht unbedingt gleich verstanden werden würde—eine gut gemeinte Bemerkung, die jedoch der stets empfindliche Beethoven als Neid abtat. Beethoven war fest entschlossen, die musikalische Elite Wiens mit seinem ersten veröffentlichten Opus zu beeindrucken und herauszufordern. Und mit ihrer gewichtigen viersätzigen Anlage und dringlichen musikalischen Dialektik müssen die Trios op. 1 wie ein frontaler Angriff auf das traditionelle Klaviertrio-Schema gewirkt haben: was aus der Feder Mozarts und Haydns ein intimes, häusliches Medium gewesen war, trat hier plötzlich als Symphonie für drei Instrumente auf. In den ersten beiden Trios war Beethovens Energie noch in die Sprache der klassischen Sittenkomödie gekleidet. Doch im c-Moll Trio Nr. 3 bricht er mit einer verblüffenden, explosiven Heftigkeit und einer dunklen lyrischen Schönheit hervor. Zwar mag das c-Moll Trio eine Reihe seiner ersten Hörer, Haydn eingeschlossen, schockiert haben, doch wurde es mit der Zeit eines von Beethovens beliebtesten Kammermusikwerken. Über zwanzig Jahre später, im Jahre 1817, schickte ein Laienkomponist namens Kaufmann ihm ein Arrangement für Streichquintett mit zwei Bratschen, das er angefertigt hatte. Beethoven ließ es kopieren, kam zu dem Schluss, dass er es besser arrangieren könne und nahm dann größere Veränderungen vor. Er überschrieb die Partitur mit einem scherzhaft-ironischen Kommentar, in dem er sich spöttisch über Kaufmanns Bemühungen um ein „3stimmiges Quintett“ äußerte, dass er „aus grösster Miserabilität zu einigem Ansehen erhoben“ habe, da das Original „den Untergöttern als ein feierliches Brandopfer dargebracht worden“ sei. Beethoven warf jedoch bei Weitem nicht alle Ideen Kaufmanns über Bord, so dass die Endversion, die 1819 als op. 104 herausgegeben wurde, eine Art Gemeinschaftswerk darstellt. Die Stimme der ersten Violine birgt noch einige Hinweise darauf, dass sie ursprünglich eine Klavierstimme war. Doch ist die Bearbeitung für Quintett sonst sehr ausdrucksvoll und die allermeisten besonders pianistischen Passagen sind gelungen für Streichinstrumente umgearbeitet und mit einer Reihe von imitativen Stilmitteln angereichert. Beethovens einzige—geringfügige—strukturelle Änderung findet sich im Finale, wo die Reprise ursprünglich durch eine ausschweifende chromatische Tonleiter in der Klavierstimme eingeleitet wurde—eine Art Minikadenz. In der Quintett-Version ist diese Überleitung „thematisch“ und nicht mehr reine Verzierung: in den unteren Stimmen erklingen die ersten vier Noten des Hauptthemas, während die chromatische Tonleiter, die nun von der ersten Violine gespielt wird, von acht Takten auf vier reduziert ist. Der geheimnisvolle, bedeutungsschwere Unisono-Beginn (der im Quintett ohne die Anfangswendung erklingt) erinnert—vielleicht zufällig, vielleicht auch nicht—an Mozarts Klavierkonzert in derselben Tonart (KV491), ein Werk, das Beethoven sehr geschätzt haben soll. Die abrupten, extremen Kontraste, die leidenschaftliche Rhetorik (schon die erste Seite ist voller sforzando-Akzente), die mit einem intensiven Pathos und einer sehnsuchtsvollen Lyrik alternieren, sind jedoch alle typischer Beethoven. Es kündigen sich hier bereits die berühmten heroischen Erzählungen an, die in Beethovens mittlerer Schaffensperiode so vorherrschen würden. Zu Beginn des Durchführungsteils gibt es einen besonders spannenden Moment, wenn das ursprüngliche, nach oben transponierte Echo des Hauptthemas im Pianissimo hier einen Halbton herunter transponiert erklingt und damit die Musik in eine neue, fremde tonale Region führt (Ces-Dur, was enharmonisch vertauscht als H-Dur notiert ist). Es ist typisch für Beethoven—in allen Schaffensperioden—, dass eine leise Eröffnungsphrase als energisches Fortissimo zu Beginn der Reprise wiederkehrt. Dann, und das ist vielleicht die atemberaubendste Wendung überhaupt, gleitet die Musik zuerst im Pianissimo nach C-Dur, wobei das Cello die Leitung übernimmt (was in der Version für Quintett von der ersten Violine imitiert wird) und dann in die „neapolitanische“ Tonart Des-Dur, wo eine neue cantabile Durchführung des Hauptthemas stattfindet. Nach diesem intensiven Sonatendrama ist die Atmosphäre im langsamen Satz—Variationen in Es-Dur über ein schlichtes, kirchenliedartiges, für Beethoven charakteristisches Thema—weniger angespannt. Doch sind auch hier reichlich originelle, authentisch Beethovensche Momente: die ungestüme dritte Variation mit ihren brüsken sforzando-Akzenten und leicht näselnden Pizzicati, die vierte Variation in es-Moll, die mit einem klagenden Cello-Solo beginnt oder die Coda, die mit einer reichen chromatischen Umarbeitung des Themas anhebt. Der dritte Satz—ein Gebilde, das irgendwo zwischen Menuett und Scherzo anzusiedeln ist—kehrt zu dem aufgewühlten, explosiven c-Moll des ersten Satzes zurück. In dem C-Dur Trio raut Beethoven mit Genuss die Ländlermelodie in der Cellostimme auf (die in der Version für Quintett durch eine Gegenmelodie für Viola angereichert ist) und fügt wie verhexte Synkopen ein. Im letzten Satz, Prestissimo (die Tempobezeichnung ist typisch für die wilde Entschlossenheit des jungen Beethoven, „extrem“ zu sein), werden Heftigkeit, unterdrückte Erregung und, im zweiten Thema in Es-Dur, lyrische Zartheit einander gegenübergestellt. In der Reprise bewegt sich das zweite Thema sehr pathetisch von C-Dur zu c-Moll. Die bemerkenswerte Coda, die während ihrer 87 Takte fast durchgehend im Pianissimo gehalten ist, rutscht in geheimnisvoller Weise nach h-Moll und bewegt sich dann über c-Moll und f-Moll nach C-Dur. Der Schluss ist jedoch ruhelos und mehrdeutig; ein Gefühl von Auflösung will sich nicht so recht einstellen (dafür liegt das f-Moll nicht weit genug zurück), so dass an einen Dur-Optimismus überhaupt nicht zu denken ist.